I don't have long today, but I wanted to post some new pictures! 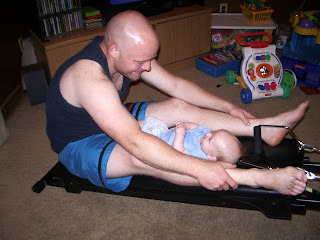 I have the greatest shots of Ethan working out with Daddy from the other night! 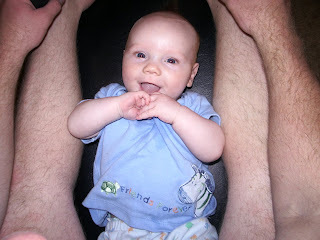 He is getting big, He is such a cross between Cam and Colin, what do you guys think? So, have you guys talked about coming up? Kar--check your email, I wrote yesterday about the 30th thru the 5th! We'll be there! There's a WHAT in my wall?! ?